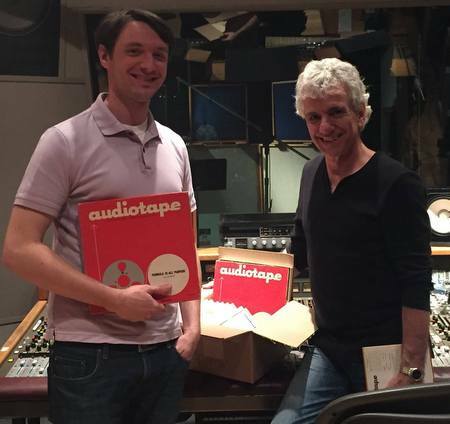 CCNY music librarian Michael Crowley [left] and Steve Addabbo, transfer engineer at Shelter Island Sound, with recordings of Ravi Shankar’s music. Before Ravi Shankar, whom George Harrison called the “godfather of world music,” became the internationally-recognized legend that he remains today, he was a City College of New York visiting professor. Shankar taught courses at CCNY in the fall of 1967, including Special Topics: Music in Indian Culture: Theory and Practice (graduate). Forty-eight class meetings were recorded and are currently housed in the CCNY Archives and Special Collections. On them, Shankar explains the origins of Indian classical music, describes and demonstrates the music theory behind it, and leads students in singing exercises and devotional songs. The recordings include two sitar concert performances by Shankar. Another features two sarod concert performances by a young Aashish Khan, with a demonstration of how Indian raga is taught. “These recordings are a treasured resource for CCNY alumni, students of Indian classical music and all music lovers,” said Michael Crowley, chief of the CCNY Music Library. The rare and previously unavailable audio, currently held on 76 reels in City College’s Music Library, will soon be available to a wider audience thanks to a $15,000 grant that the Ravi Shankar Foundation received from The GRAMMY Foundation® Grant Program. The grant enables the foundation, in partnership with East Meets West Music (the foundation’s official record label) and the CCNY Archives and Special Collections, to preserve the recordings by digitizing and transcribing them, and making them accessible. Since 1847, The City College of New York has provided low-cost, high-quality education for New Yorkers in a wide variety of disciplines. More than 15,000 students pursue undergraduate and graduate degrees in the College of Liberal Arts and Science; Bernard and Anne Spitzer School of Architecture; School of Education; Grove School of Engineering; Sophie Davis Biomedical Education/CUNY School of Medicine; and the Colin Powell School for Civic and Global Leadership. U.S. News, Princeton Review and Forbes all rank City College among the best colleges and universities in the United States.